Part Machine. RoboCop is an iconic character from the classic Sci-fi movie of the 80s. - Authentic and detailed fully realized likeness of RoboCop in the movie. - Contains diecast material. Goodnight.”. Authentic and detailed fully realized likeness of RoboCop in the movie. (Docking Station) special features - Contains diecast material. - One (1) diecast pistol. The Brown Box was opened for checking. Authentic and detailed fully realized likeness of RoboCop in the movie. ~ Movie Masterpiece Diecast Series ~. - Contains diecast material. 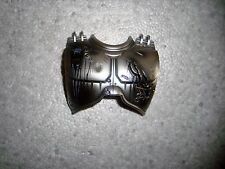 - Black, light grey and silver armor. - Special features on armor. Goodnight. '., 'Stay out of Trouble!'. Protect the innocent. Uphold the Law.'. ~PAUL VERHOEVEN'S~ROBOCOP~. This is our very Last One, so do not falter on your attempt to capture the Robotic Police Officer for your Sci-Fi Collection. Uthentic and detailed fully realized likeness of RoboCop. Contains diecast material. Protect the innocent. Uphold the law.'. One (1) pistol. One (1) fist with spike. One (1) pair of fists. One (1) pair of palms with improved articulation and movable fingers. 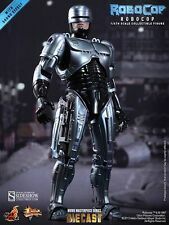 Up for sale is this Hot Toys RoboCop MMS 12. (NOT MMS 204). REACHING US. Outer Box in Great Condition. 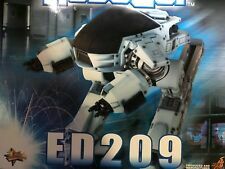 You have 20 seconds to comply.'. ; 'You now have 15 seconds to comply.'. ; 'You are in direct violation of Penal Code 1.13, Section 9. You have 5 seconds to comply. Four.three.two.one.I am now authorized to use physical force.'. 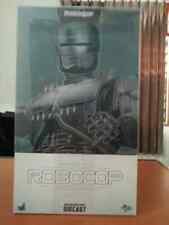 (HOT TOYS 1/6 ROBOCOP DIECAST with. diecast ver. SOUND EFFECT. 'Stay out of trouble!'. 100% MINT IN CONDITION NEW IN BOX FACTORY SEALED! NEW FACTORY SEALED! Protect the innocent. Uphold the law.'). Goodnight.'. ; 'Stay out of trouble!'. Protect the innocent. Uphold the law.'. Part Machine. The newest addition to Hot Toys MMS Diecast series is specially designed with diecast material for greater realism. The MMS Diecast series brings fans a higher level of authenticity, focusing on materials, fine details and engineering. [ Release Date(yyyy/mm/dd) ] 2014-11-28. We accept only unopened item. When we receive back item. We do our best for you!! See pictures for more detail. FREE Trial ! These are not life-size and cannot be used by actual people. (NON-NEGOTIABLE). 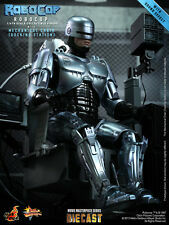 HT-902057 Hot Toys MMS203 Robocop 1/6 Diecast Mechanical Chair Docking Station. Authentic and detailed fully realized likeness of RoboCop in the movie. (Docking Station) special features Head Art Directed by JC. Chair painted by: Lee Youn Young. - Contains diecast material. - One (1) diecast pistol. The newest addition to Hot Toys MMS Diecast series is specially designed with diecast material for greater realism. Goodnight. '., 'Stay out of Trouble!'. Protect the innocent. Uphold the Law.'. ~PAUL VERHOEVEN'S~ROBOCOP~. Authentic and detailed fully realized likeness of RoboCop in the movie. (Docking Station) special features - One (1) fist with spike. - Contains diecast material. - One (1) diecast pistol. - Four (4) interchangeable lower faces. ROBOCOP appears from 'SF action movie Robocop' to 'Movie Masterpiece DIECAST' suitable for reproducing mechanical characters by using alloy in the body! Figures with a total height of 30 centimeters and 25 places or more move are Cyborg cops Robocop is beautifully three-dimensional. By using "alloy", this item aiming for more reproducibility of the character has the same range of motion as the conventional Movie Masterpiece but feel the texture of the original mechanical armor and the response with Zushiri Reproduce the heaviness. Metallic armor characterized by silver coloring is subjected to shiny metallic paint shining in the alloy. Four types of replacement face parts can be replaced in the head. Changing the mouth makes it possible to produce a rich expression.